Interventions to improve quality of care for patients with diabetes should focus on the patients and their individual problems, as well as on restructuring care.6 Structured and well-coordinated healthcare that includes close monitoring can delay or prevent the onset of complications and thus improve the treatment of patients.7 General practitioners (GPs) in Germany play a central role in performing and coordinating the provision of care for their patients with diabetes.8 However, most German GPs work in small private practices (1 or 2 physicians) with no involvement in large managed healthcare plans. Two attempts to integrate chronic care structures into this system were the nationwide disease management program (DMP) and GP-centered healthcare contracts (in several federal states). 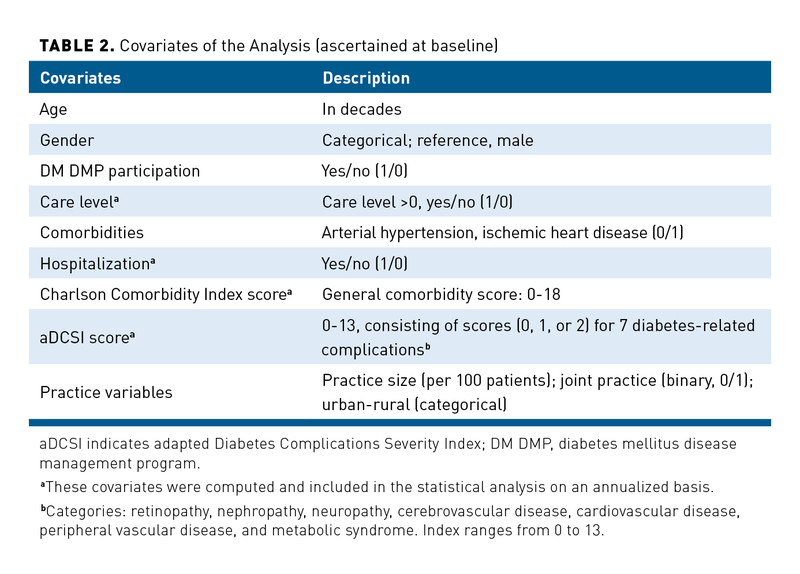 Only 18% of registered interventional diabetes studies include patient-oriented outcome measures as primary outcomes.13 Patient-oriented outcomes may be death and quality of life (compromised by major morbid events, such as stroke, myocardial infarction, amputation, loss of vision, and end-stage renal disease, or minor morbid events, such as hypoglycemic events). Most noninterventional evaluations of diabetes outcomes within integrated healthcare management programs have reported all-cause mortality6,7,14 or diabetes care costs2,15,16 as primary outcomes. All-cause mortality is an end point that must account for the possibility of competing risk factors, which are not always visible (nonmeasurable confounding) in claims data evaluations. Furthermore, lower costs do not always reflect better treatment. However, we regard clinically significant complications as the more relevant patient-oriented outcomes. The aim of this retrospective closed-cohort study was to evaluate the development of diabetes outcomes in terms of clinically significant complications, comparing those of patients enrolled in GP-centered healthcare programs with those of patients in usual GP care. The analysis was carried out as part of an evaluation of HZV in the German regional state of Baden-Württemberg and was fully approved by the ethics committee of Frankfurt University Hospital. All participants in the study were insured by the largest regional statutory healthcare fund, Allgemeine Ortskrankenkasse Baden-Württemberg (AOK-BaWü), which has 4 million members. 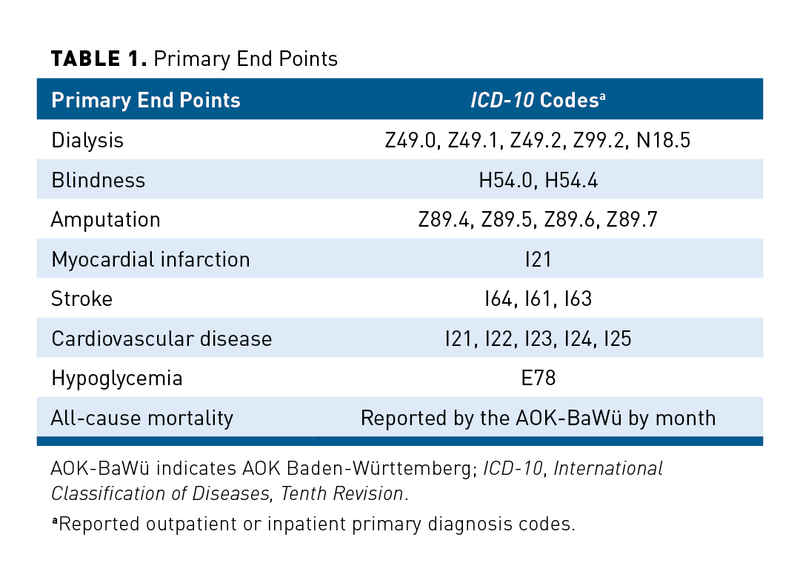 To be included in the study, participants had to have diabetes (International Classification of Diseases, Tenth Revision codes E10-E14), be ongoing AOK-BaWü members, live in Baden-Württemberg, be 18 years or older, not be participating in other healthcare programs, and satisfy further administrative inclusion criteria. Patients in the HZV group had to enroll in the program before January 1, 2011; patients in the usual care group had to have an identifiable GP. Patients who switched to other healthcare funds during the observation period (2011-2014) were excluded. We considered deceased patients to be censored observations until time of death. We had no missing values because of our inclusion criteria (available insurance data) and study design. We conducted a retrospective closed cohort study. Administrative data were provided by AOK-BaWü for the years 2010-2014. The primary end points and covariates of this analysis are shown in Table 1 and Table 2. The period prior to the occurrence of a clinical end point was calculated in days (beginning on January 1, 2011) until the occurrence of an index event (end point). The Kaplan-Meier estimator was used to estimate the survival function. A multivariable Cox regression model was used to analyze the time until an end point was reached (Table 1) using the covariates listed in Table 2. We present hazard ratios (HRs) as point estimates with 95% CIs and P values (P <.05 was considered significant). Because this was an exploratory study, no adjustment for multiple testing was performed. All analyses were implemented using SAS version 9.4 (SAS Institute Inc; Cary, North Carolina). We identified 318,311 patients with diabetes in the AOK-BaWü population. After applying our inclusion criteria, 217,964 patients were included in our analysis: 119,355 were enrolled in the GP-centered healthcare program (HZV) and 98,609 patients received usual GP care (non-HZV). Table 3 shows patient characteristics at baseline. The mean age of the patients in both groups was 69 years, and the distribution of gender in both groups was similar, but there were several baseline differences between patients in the HZV and non-HZV groups. More patients in the usual care group had a care level greater than 0 (ie, receiving long-term care). A larger percentage (77.3%) of HZV patients participated in the DM DMP compared with the non-HZV group (53.4%). Patients in the HZV group had higher Charlson Comorbidity Index (CCI) scores and had higher scores on the adapted Diabetes Complications Severity Index (aDCSI). Baseline practice characteristics on the patient level are also shown. GP practices in the HZV group were larger in number of AOK-BaWü patients, were more often located in rural areas, and were more often joint practices. 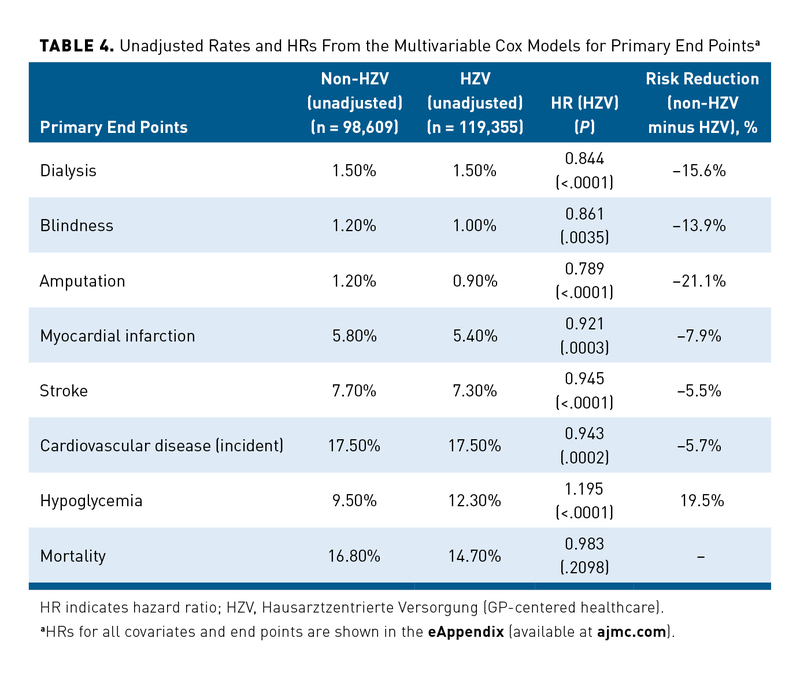 In the multivariable Cox regression models, participation in the HZV group was a significant protective predictor of all end points, apart from hypoglycemia and mortality (Table 4). Compared with usual care, the HZV group showed a 15.6% reduction in the risk of requiring dialysis (HR, 0.844; P <.0001) during the 4 years of observation. In the HZV group, the risk of blindness was 13.9% lower (HR, 0.861) and the risk of amputation 21.1% lower (HR, 0.789). The differences in risk were not as high for myocardial infarction, stroke, and cardiovascular diseases, but were still significantly in favor of the HZV group. HZV participants had a higher risk (risk difference, +19.5%) of hypoglycemia during the 4 years compared with the non-HZV group. The unadjusted mortality rate in the HZV group was lower than in the non-HZV group. In the Cox regression model, participation in the HZV group was a protective predictor but not a significant one. Over the 4-year observation period, female gender and participation in the DM DMP were significantly protective with regard to all end points, with the exception of mortality and hypoglycemia. For many complications, female gender and participation in the DM DMP had a larger influence than participation in the HZV group. Previous hospitalizations and more comorbidities (higher CCI and aDCSI scores) were significantly associated with the likelihood of serious complications during the 4-year period. To the best of our knowledge, this study is the first evaluation of the development of all serious end points associated with diabetes complications in a structured healthcare system in Germany. Over 4 years of observation, outcomes in the HZV group were significantly better. This study revealed lower unadjusted incidence rates for all primary end points, apart from hypoglycemia, among patients in the HZV group. The results were further confirmed using HRs. We found the covariate of participation in the DM DMP to be an important independent predictor of better outcomes. Nationwide DMPs in Germany have existed for longer than HZV. DMPs in a primary care setting were first available in Germany in 2003 and in HZV (Baden-Württemberg), by comparison, in 2008. About 3.9 million patients were enrolled in a DM DMP.22 Several studies have been published on the effectiveness of this program.6,23 A study by Linder et al did not reveal any clear medical benefit from participation in the DM DMP.24 At the same time, we do not have any comparable figures on complication rates from studies regarding the DM DMP. Several studies of diabetes-related end points did not include a control group to compare with DM DMP participants. 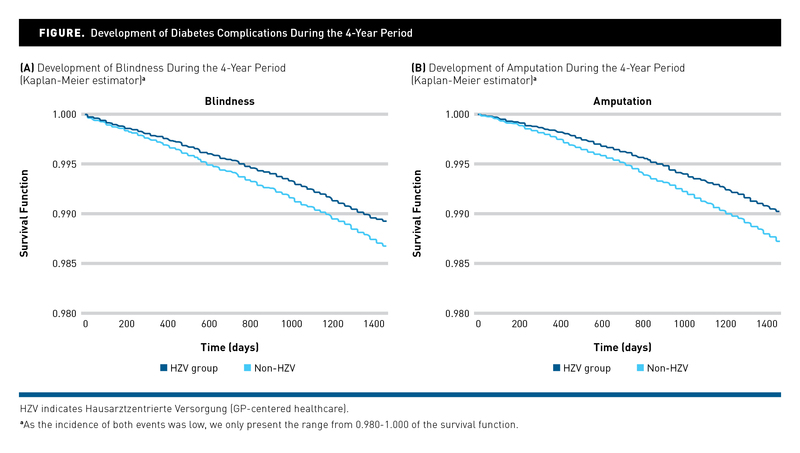 Even KV Nordrhein’s comprehensive evaluation of DMP (a quality assurance report from German federal state North Rhine) did not include a time-dependent analysis of a closed cohort and a control group.23 However, reduced diabetes complications cannot be directly attributed to either the DM DMP or HZV, as the DM DMP was a main feature of HZV. Furthermore, the DM DMP and HZV both promote a focus on the continuity and coordination of care.6 HZV enhances the implementation of DM DMPs by increasing recruitment (77.3% of HZV patients participated in a DM DMP compared with 53.4% in the non-HZV group), as a result of structured quality circles on drug therapies, and due to higher drug adherence and the special coordinating role of the GP. The HZV contract in Baden-Württemberg is capitation-based and independent of the German fee-for-service system. This would also have had an impact on the intervention. Several studies’ results have demonstrated that patients with diabetes benefited from participating in an integrated health delivery system.7,9,14,25,26 International studies show that participants with diabetes who enrolled in an integrated healthcare program were less likely to be readmitted within 90 days of discharge.14 Integrated healthcare was effective in improving clinical outcomes, reducing the general outpatient clinic utilization rate over a 12-month period,26 and lowering the mortality rate.7 However, we were not able to find a related study on the time-dependent development of complications. In Germany as well as in the United States, a large portion of care for the chronically ill is provided in small private practices that often strive to enhance chronic care and establish a medical home.27 In such a system of primary care, our finding that a strengthening of structured care is associated with a delay or reduction in diabetes complications may be of interest. It should be noted that participation in HZV was not randomized, but voluntary. As such, there is a natural selection bias, which we tried to attenuate by adjustment for the potential influence factors. Our study benefits from the large size of the population-based sample and the inclusion of patients with type 1 and type 2 diabetes. We had doubts about the correct coding of type 1 and type 2 diabetes, so we pooled both types in our analysis. We retained deceased patients in our analysis as censored observations. The present study was able to demonstrate that GP-centered healthcare delayed the development of diabetes complications over a 4-year period. 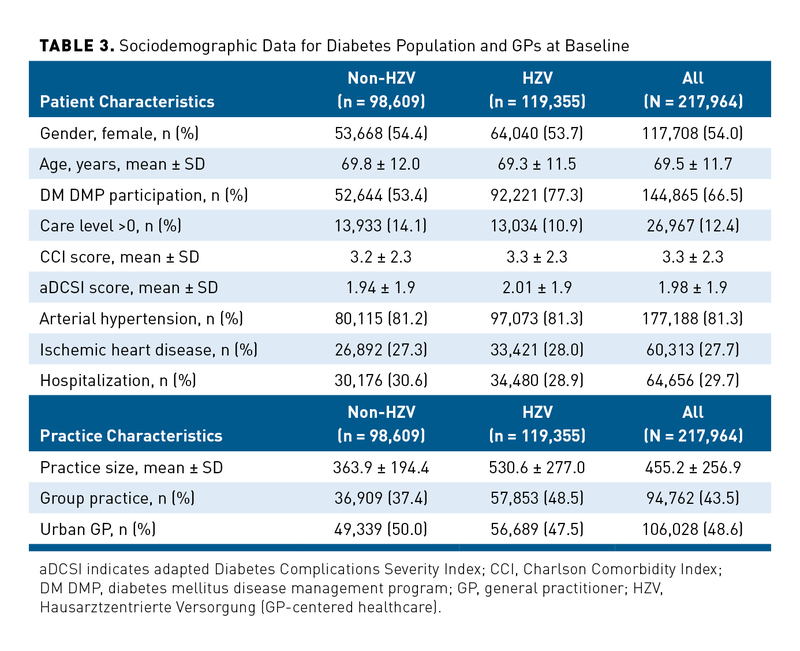 The lower rates of diabetes complications in the HZV group may be attributable to well-coordinated GP care and participation in a DMP.